Devil’s Slide Coast: a collection of protected lands and marine areas that starts just north of the Devil's Slide Tunnel and stretches to the famed Mavericks surf break. Mori Point is a haven for walkers and wildlife. Take an easy boardwalk stroll to the ocean, then go north for another scenic walk along the California Coastal Trail or go south and climb spectacular stairs for top-of-the-world ocean views. Terrain is varied: walks range from a level half-mile stroll to a steep 1.5-mile hike. The endangered San Francisco garter snake and the threatened California red-legged frog find protection in Mori Point’s native coastal prairie vegetation. hiking, bicycling, on-leash dog-walking, wildflower and beach views, wetland park with habitat for California red-legged frog and San Francisco garter snake. Black sand at Sharp Park Beach. These two beaches in the City of Pacifica are popular with surfers, anglers and visitors out for a stroll. Pacifica State Beach offers a recreation trail along the ocean, surfing and surf camps, restrooms and showers, and is popular with dog walkers. Fish the surf at Rockaway Beach, or watch the sunset framed by bluffs and rock formations just offshore. Beaches are open from dawn to dusk year-round. Come explore the spectacular Pedro Point Headlands, a 246-acre park laced with dramatic trails and heart-stopping views of the cliffs below. You’ll quickly leave all sights and sounds of the highway behind as you hike to the top of the coastal ridge and gaze down on your own private view of the pounding surf. Look carefully and you can see the path of the old Ocean Shore Railroad. Hiking, on-leash dog-walking, habitat restoration community events. 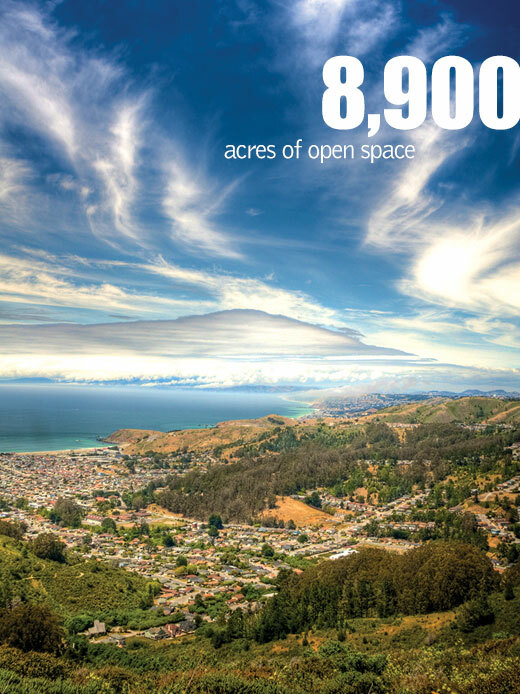 Owned by the California Coastal Conservancy and the City of Pacifica, with volunteer stewardship provided by the Pacifica Land Trust. The Land Trust's Pedro Point Headlands website includes a map of the trails, as well as notices of upcoming volunteer events where the community is welcome to help care for and learn about this park. Hiking and bicycling along the trail while taking in views of the Pacific Ocean. On clear days, the Farallon Islands are visible. Parking lots, restrooms and informational kiosks are available at the north and south points of the trail. The California Coastal Trail (CCT) is one of the great trails of our nation. Once completed, it will extend 1,200 miles from the Oregon to Mexican borders, and will provide a network of public trails for walkers, bikers, equestrians, wheelchair-riders and others along the California coastline. While informal trails along our coast have been used for centuries, the CCT’s recent history began in 1972 when California passed Proposition 20 recommending that a trails system be established along or near the coast. Today, over half of the CCT is complete. The CCT is a “braided” trail system. Some sections are on the beach or the bluffs above, others run along the shoulder of Highway One or nearby roads. The trail connects travelers to California’s varied and ever-changing landscapes. Wherever you travel on the CCT, you can find spectacular ocean views and memorable glimpses of marine life. The CCT is a joint undertaking of the Coastal Conservancy, in cooperation with the Coastal Commission, the California Department of Parks and Recreation, CalTrans, Coastwalk, and many other non-profit organizations and community groups. Many (but not all) CCT trailheads provide parking, restrooms, and kiosks with maps. Montara State Beach is a beautiful sandy cove nestled among majestic cliffs. Although swimming is not recommended, the beach offers picturesque views and a variety of recreational activities. Whether surf fishing, kite-flying, beachcombing or just relaxing, there are many ways to enjoy this magnificent beach. Layered clothing is recommended and beach accesses are steep. There are two beach access points from the bluff. One is across from Second Street, immediately south of the Outrigger restaurant. The second access is about a half-mile north on the ocean side of Highway 1. A guided tour of the reserve at low tide allows a peek into the abundant marine life that populates this unique intertidal habitat. No collecting of plants or animals is allowed at this Marine Protected Area. Nearby, the historic Point Montara Light Station’s restored turn-of-the-century buildings offer travelers a beautiful picnic spot or overnight stay in its hostel. Tidepool exploration and beach walking. Ranger and docent led tours for groups of 10 or more can be scheduled. Parking lot, informational kiosk, restrooms and a small visitor center. The bluff offers hikers, joggers and dog walkers a chance to take in the sights and sounds of the Pacific Ocean. The bluff includes a section of the California Coastal Trail and offers views of Fitzgerald Marine Reserve and other area landmarks, including Mavericks—the home of big-wave surfing. South of the bluff in Princeton is Pillar Point Harbor, home port to the area’s commercial fishing industry, sport fishermen and pleasure boaters. Hiking and bird watching. Dogs on leash are allowed. At nearly 4,000 acres, Rancho Corral de Tierra is one of the largest expanses of protected land on the Devil’s Slide Coast. Once proposed for development, this stunning, mountainous terrain is now national parkland. The dramatic ascent of Montara Mountain from the sea offers spectacular views of the entire San Francisco Bay Area. hiking, biking, equestrian trails, on-leash dog-walking on specified trails. Climb 2,000 ascent of Montara Mountain for panoramic coastal views. Park at Gray Whale Cove and hike through McNee Ranch State Park. Check NPS site for updates and new access points. National Park Service management of the area has just begun. Many of the existing trails are very steep and eroded and may be difficult to traverse until they are repaired or re-routed. The process of transforming the property into a national park is only just beginning. NPS and GGNPC are working with the community and various stakeholders to improve trails, trailheads, and amenities. Rugged and beautiful, McNee Ranch marks a northern spur of the Santa Cruz Mountains and features the only undisturbed coastal mountain habitat found on more than 100 miles of coastline. A part of Montara State Beach, the park contains a network of trails of varying difficulty and usage, and is appealing to hikers, mountain bicyclists and equestrians. At 1,898 feet, its peak offers sweeping vistas of the entire Bay Area. Hiking, mountain biking, horseback riding, dogs on leash. Parking at Gray Whale Cove Beach on inland side of Highway 1. Picnic tables and benches along trails. No water; chemical toilets near ranger residence. The 1,100 acres of this lush park offer something for everyone: miles of trails, several year-round creeks, rugged coastal scrub and green valleys, as well as a visitor center, a self-guided nature trail, and picnic sites. Often sunny when the rest of the San Mateo County Coast is foggy, San Pedro Valley Park is popular with hikers. Hiking, picnicking, bird watching; youth group camping by reservation. Parking lot, restrooms, drop-in picnic areas, barbeque pits, and informational kiosks. The visitor center is open on weekends. Large group picnic areas and youth camping areas are available by reservation. The San Mateo County Historical Association provides tours of the adobe and special programs, including demonstrations of brick making and corn grinding and the annual Rancho Day in September. School tours are scheduled through the San Mateo County Historical Association. There are no hiking trails. Drinking water, restrooms, and parking area. Standing on Sweeney Ridge in the fall of 1769, Spanish soldiers of the trail-blazing Gaspar de Portolà expedition were the first Europeans to lay eyes on San Francisco Bay. Today, this national parkland offers hiking opportunities, as well as chances to volunteer on habitat restoration projects that benefit the native plants and animals that live here. If it’s foggy on the coast, climb up a thousand feet and get the reward that those early explorers did—a view of the Golden Gate.